was born May 7, 1922 in Uruapan, Michoacán. He lived in Cuernavaca, Morelos. From 1936 to 1939, he studied agriculture at La Huerta Agriculture Community College, in Morelia, Michoacán. In 1939 he painted a portrait of the Governor of the State, which enabled him to obtain a scholarship to study art in Morelia’s Art School. Between 1941 and 1944 he studied at The Esmeralda Academy, in Mexico City, while making a living painting houses and held other odd jobs that required his painting talents. He joined Taller de Grafica Popular in 1941. During 1946 he sketched miners from Pachuca, Hidalgo for the Association of American Artists. That same year he married Elizabeth Catlett. From 1949 on he was a professor of art in the daytime, and of continuous adult education in the evenings. He made a great number of engravings for the Journal of the Teachers Association, and magazine “El Maestro Mexicano” (The Mexican Professor). 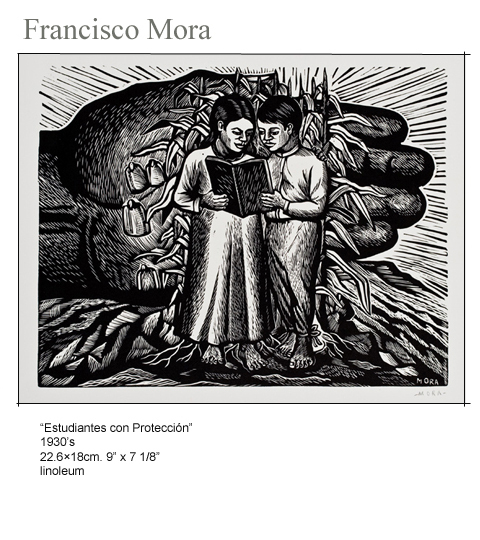 He also made a series linoleum engraving about “Los hombres de la Reforma” (The Reformist Men). In 1950 he painted a mural for the building of the daily “Sol de Toluca”. He was Mexico’s representative to the 1960 Pedagogy World Congress, in Conakry, Guinea and traveled extensible in East and West Europe. In 1964 he had a solo Abstract Art Exhibit in National Palace of Fine Arts in Mexico City. In 1965 he resigned the TGP.